Screenplay: Simon Pegg, Edgar Wright. Starring: Simon Pegg, Nick Frost, Kate Ashfield, Dylan Moran, Lucy Davis, Bill Nighy, Rafe Spall, Martin Freeman, Tamsin Greig, Reece Shearsmith, Matt Lucas, Chris Martin, Trisha Goddard, Krishnan Guru-Murthy, Vernon Kay. 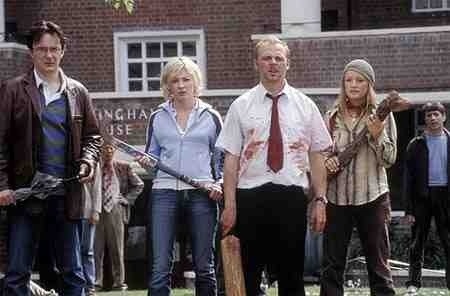 I find there’s always been an element of humour to the old George A. Romero zombie flicks. Let’s face it, how hard does it look to get away from them? There were always plenty of thrills and I love those films, but sometimes it seemed they were taking the piss. With this film, there’s no doubt that it’s doing just that. 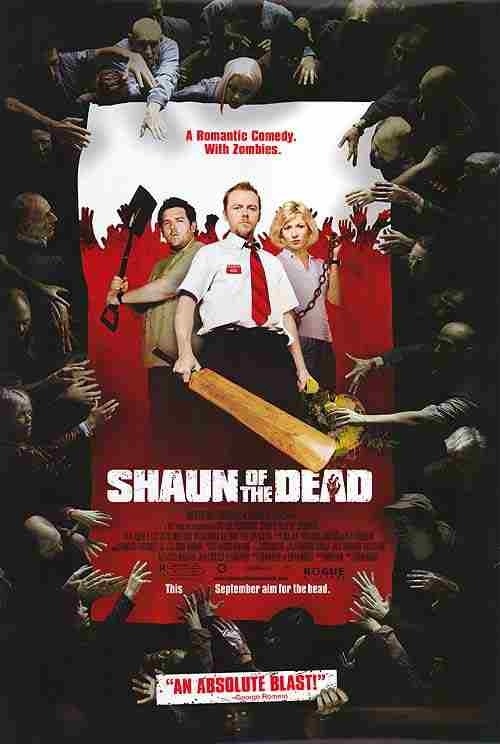 Shaun (Simon Pegg) is in a dead end job, just split up with his girlfriend and shares a flat with his idle best pal Ed (Nick Frost), who does nothing but play playstation, eat cornettos and frequent the local public house. Shaun’s life is frankly, going nowhere. However, when an outbreak of flesh eating zombies happen to start appearing around his neighbourhood, taking bites out of his family and friends, Shaun finds his purpose in life. Armed with a cricket bat and batch of old vinyl L.P.’s he sets out to save his loved ones and hide out in his favourite pub, till it all blows over. An impressive pastiche of the zombie films of old, injected with some hilarious humour and fine comedy moments. Director Edgar Wright cut his teeth on the T.V. Series “Spaced” and brings the same cast to this, as well as some other familiar faces from British comedy shows like, “The Office”, “League of Gentleman” & “Black Books”. It’s Wright’s familiarity with the genre that’s most impressive though, he could quite easily have played it straight and still came across as a competent director of horror. He employs excellent use of atmosphere and structure with some wonderfully inventive camerawork. I was very impressed, considering it’s his first feature length film and it’s no surprise that Tarantino & Rodriguez had him direct one of the fake trailers on their “Grindhouse” double feature. On the down side though, I found some of the gags forced and the jokes (much like the flesh eating un-dead) became rather stale. With no fresh ideas after passing the hour mark, it started to show it was really a 30minute television episode, drawn out to feature length. Still, there’s bags of fun to be had with fine performances from a great cast and Pegg and Frost are an excellent comedy duo. This entry was posted on January 12, 2012 at 5:13 pm and is filed under Comedy, Horror with tags 2004. You can follow any responses to this entry through the RSS 2.0 feed. You can leave a response, or trackback from your own site.